Key Medium specializes in quality affordable nonprofit website design for organizations. Key Medium creates websites for nonprofit organizations at a discounted rate through a Coding For Causes grant. We give back to great causes by helping them with websites that share their mission, grow their donor base, and empower them to raise more money through online fundraising. Find out what’s right for you. Schedule a free one-on-one consultation, or explore our showcase nonprofit website design work below. I LOVE our college website redesign and the collaboration with the Key Medium Team! I am very satisifed and happy with the execution and quality of work. For over 40 years, nonprofit WFI City College has helped people find their fit through industry-driven career programs in a supportive, engaging and vibrant learning community. What’s more, their aim is not only to help graduates gain employment but to help them build fulfilling lives with highly sought after programs, including a world-class web design program. 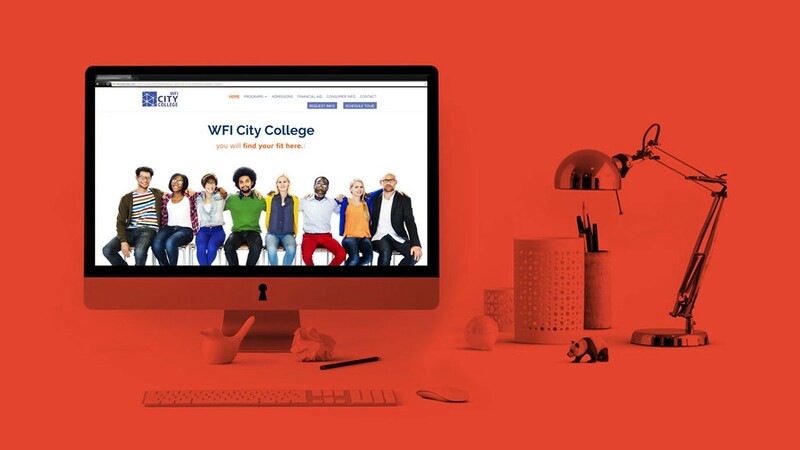 WFI City College was receiving zero enrollment leads, they were facing accreditation issues due to lack of access to information – thanks to an unsustainable website platform from PHMC (Philly’s largest nonprofit) – and were middle of a brand identity crisis. They also lacked a marketing strategy and the college’s website was dated and unappealing. The solution to their dated brand, website, and lack of an integrated marketing strategy led to the creation and execution of a SMARTER marketing strategy and a brand-new website. We worked with PHMC to migrate from under their purview, delivered a brand refresh, along with an integrated strategy – complete with a website overhaul that provided prospective students with access to information through a robust WordPress platform. Key Medium provided them with our Complete Custom Website solution. To kickstart their revitalized brand, Key Medium included Standout Branding, website design services, as well as a refreshed brand identity, complete with a striking color palette and modern, minimalist aesthetic. We designed it to be beautiful, discoverable, and easy-to-navigate for prospective students to learn everything they need in just a few clicks or taps. The College subscribed to a monthly maintenance package to ensure site continued site performance and security. They also invested in PPC and display advertising for a set of re-launch campaigns, reaching prospective students online. By working closely with Gamelin Associates and by adding an enrollment marketing specialist and content strategist to our talented team, we developed a unified brand strategy that intertwined content with design and development. We created new marketing collateral to convey a memorable, meaningful message that aligned with their business goals and aspirations. Our founder is an expert in Google’s best practices and latest innovation and our results speak to that success. We followed mobile-first principles, fixed 100% of errors in Google Search Console and set up redirects to new pages to retain page authority. Keeping tabs on Google’s ever-changing algorithms is crucial to improving upon and retaining a substantial digital footprint. Due to its dramatic overhaul in development, design, branding, and messaging, WFICityCollege.edu received a 2018 W3 Awards Gold and a 2018 Davey Awards Silver in the Websites – School/University category. Since launch, the site has generated an unprecedented amount of traffic, engagement, and buzz. From a brand refresh to a complete website overhaul and the execution and planning of an integrated marketing strategy, their new website immediately began generating an unprecedented amount of targeted traffic and engagement. Traction. In the first month, the launch campaign generated nearly 100 calls and a dozen qualified enrollment leads – with over 100k impressions. An Estimated 16:1 ROI. Direct enrollment attributed to the new website platform paid for itself 16 times over several months following launch. Accessible Information for Prospective Students. We provided information to students beyond accreditation requirements – with a focus on the benefits of the specific programs, financial aid, admissions, and more. Results Within 48 Hours. In just the first two days and with no digital advertising media in-market, City College received their first-ever lead from their website. Record-Level Organic Search Impressions. 1000% increase in search impressions within the first month of launch. Google updated its cache of the homepage and updated the new URL to the secure variation – within 12 hours. We’ve never before seen such a rapid crawl, re-indexing, and refresh of search results ever. Smooth Migration from their Legacy Platform and Webmaster. We worked with Philadelphia’s largest nonprofit, the Public Health Management Corporation (PHMC), to migrate the new website over with ease. What is a SMARTER marketing strategy? At Key Medium, we craft beautiful and high-converting websites with an accompanying, integrated marketing strategy. The integrated strategy for brands we work with are partially based on the SMART marketing framework, with an additional component that is used to evaluate and reevaluate (SMARTER) the efficacy and efficiency of the marketing program, informed by data and in a holistic manner. Does your website need a digital gameplan or a design refresh? You can achieve the same success with your website when you hire Key Medium to build your custom website, refresh your brand, and create a compelling modern design that reflects your desired customer. Get in touch with a Key Medium expert today.